Making their very first introduction to the super-small pod system world comes the Vaporesso Nexus All-In-One Starter Kit for your all day vaping pleasure. The travel-friendly Nexus Vaporizer is an ultra-compact device that implements the very best in cutting-edge pod system chipsets. With their new-and-improved OMNI Board Mini Chip, Vaporesso has developed a long-lasting pod system that was meticulously constructed to get the very best flavor out of your favorite nicotine salts and e-liquids. Intuitively designed for top-notch performance with nicotine salts, the ultra-compact Nexus vaporizer features a durable Zinc alloy construction that’s about as easy to use as it gets. Offering a large 2mL max fill-capacity, the ultra-compact Nexus pod system supports a 100% leak-free design to ensure the e-liquid stays in the reservoir where it belongs. To fill the tank, simply remove the rubber stopper that’s hiding underneath the mouthpiece and then drip the liquid to your heart’s content. A small glass window is built into the side of the Nexus’s frame so you can easily monitor the vape juice levels and fill the tank when necessary. One of the things that sets the Nexus apart from the other pod systems is its Low-Liquid Detection, which will prevent the Nexus from firing and burning the wick if there isn’t enough e-liquid in the tank. The Nexus All-In-One Starter Kit integrates a pressure-sensing system that mimics the look and feel of taking a drag off a cigarette. Simply put the mouthpiece up to your mouth—breathe in—and vapor is automatically created. Also hiding underneath the mouthpiece is Vaporesso’s flavor-driven NX CCELL 1.00 ohm coil head which can be easily replaced when using the mouthpiece as a tool. Simply align the metal flathead section at the bottom of the mouthpiece with the two cutouts at the top of the coil and twist counter-clockwise to remove the coil. The NX CCELL coil heads have been optimized for Mouth-to-Lung vapers that are looking for a true-to-life cig-a-like vaping experience, and the Nexus even features an adjustable airflow control system that can be used to increase/decrease the amount of vapor created. Keeping up with its stylish design, the Nexus utilizes an easy-to-reach power button that doubles as a battery life indicator. Charging the battery couldn’t be any faster or easier, thanks to its easily accessible Micro-USB port at the bottom of the device which charges the large 650 mAh battery at a steady 1A. 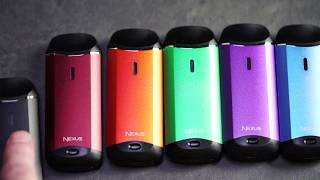 Whether you’re new to vaping or a long-time veteran vaper that’s looking for a solid pod system which utilizes cutting-edge vape technology—or just need something that’s a little bit more travel-friendly compared to the traditional sub-ohm box mod setup, the Vaporesso Nexus All-In-One Starter Kit offers an intuitive little device that raises the bar for pod systems around the world.